Gold. It’s the stuff that dreams are made of. 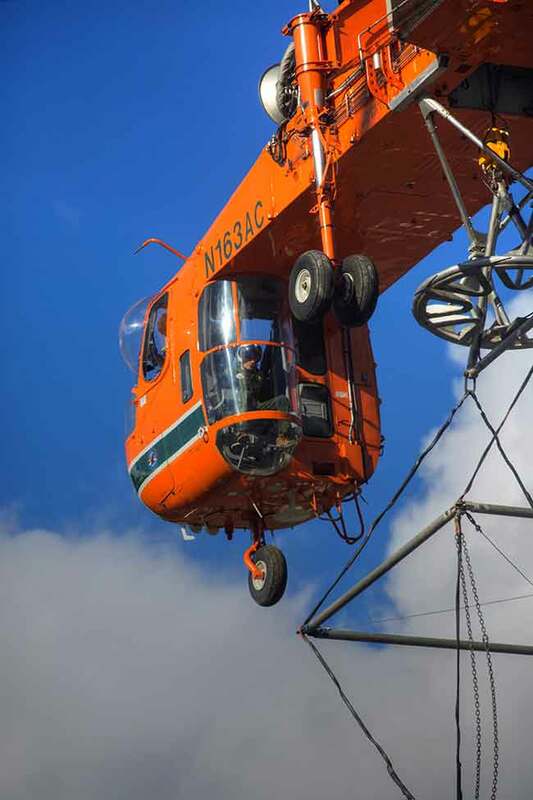 Erickson’s Skycrane has the clout to get the Brucejack mine up and running. Gold. It’s the stuff that dreams are made of. Pretivm Resources is set to cash in on that dream with its Brucejack Gold Project, northeast of Stewart B.C. The dream will become reality in mid-2017 when the mine is scheduled to become operational. As construction surges ahead on the project, the key component is the completion of a 58-kilometre 138Kv power line stretching from the BC Hydro Long Lake substation over some of the most extreme geography in North America. The lead contractor on the power line project is Rokstad Power, with the heavy lifting provided by Erickson’s S-64 Sky Crane. Based in Oregon, Erickson’s fleet of “Cranes” has become synonymous with heavy lifting around the world. Mineral exploration and development is nothing new to this vast and lightly-populated region. The northwest corner of British Columbia holds some of the world’s most significant mineral deposits. Known as the Golden Triangle, massive deposits of gold, silver and copper lay across an area that is still largely unexplored. Prospectors had worked the region as long ago as the 1860s, spawning several small gold rushes. In the 20th century, there were three significant developments: Premier, Snip and most recently in the late 1980s, Eskay Creek which eventually produced more than one million ounces of gold. The remoteness of the area, a lack of infrastructure along with long winters and extreme snowfalls meant that power, labour and logistics costs could be prohibitively high. The government of B.C. committed to supporting the potential for mining and other industrial development in the northwest corner of the province by improving road access and paving portions of Highway 37 and improving the electrical grid by construction of the Northwest Transmission Line. The NTL was designed to bring an interconnection point for future industrial development as well as clean power projects in the region, with the goal of creating employment through development. Brucejack has been touted as being the most important gold find in B.C. since Eskay Creek, but the known reserves for Brucejack show a much larger deposit. The region has widespread deposits of low-grade gold, but it was one particular sample from a site in the fittingly named Valley Of The Kings that caught the attention of Robert Quartermain, CEO of Pretivm Resources. Quartermain has been quoted that he had only seen such a similar high-grade sample in a museum or from the Red Lake Mine in Ontario. As a young geologist, Quartermain was in charge of drilling the David Bell Gold Mine at Hemlo as an employee of Teck, a most auspicious beginning for a young miner. Now, at the zenith of his career, it appears that Brucejack has the potential to eclipse Hemlo and many others that came before it. This year is a critical year in construction of the Brucejack, as production is scheduled to begin in the third quarter of 2017. Up to 800 construction workers and contractors are building the mill and permanent camp. The mill building has to be finished before the snow falls this year, so that the inside work can be completed through the winter. It is absolutely essential that the power line into the site be completed on schedule or the inside work on the mill will not be completed. Rokstad Power is the contractor building the 56-kilometre 138Kv powerline from the Long Lake sub-station into the Brucejack site, with Erickson’s Sky Crane providing the heavy lift. 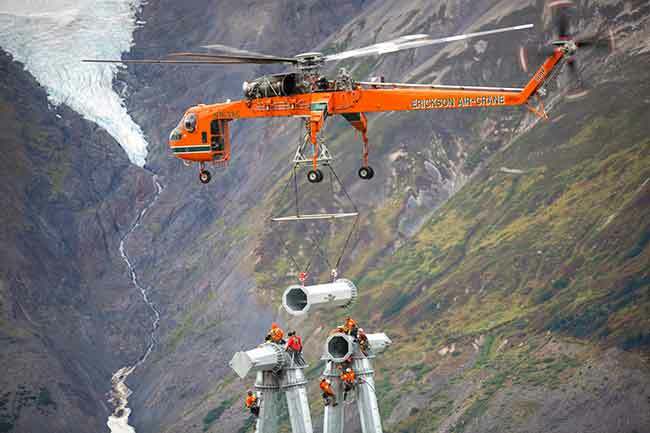 Erickson is no stranger to working with Rokstad, having partnered with them on the construction of BC Hydro’s 500Kv ILM line last year. Additionally, Erickson had been exposed to the region working for another contractor on the Northwest Transmission Line. Jeff Stein, Erickson’s power line sales manager, spoke with Helicopters about this project in particular as well as Erickson’s global operations. Ironically, as the northeastern sector of B.C. and northern Alberta were experiencing unseasonably high temperatures and extensive wildfires, the northwestern sector was living up to its reputation for long winters and deep snow. “Rokstad had hoped to be able to get started in April,” Stein relates, “but because of the late snows, we weren’t able to start flying until the middle of May. To get back on schedule, we’ve sent a second aircraft up there.” The snow could begin again as early as late September or early October, so the pressure is on to get it done. There are almost 400 towers on the 56-kilometre line. That translates into almost 20 million pounds of concrete and five million pounds of steel. It also means up to four yards of concrete at a time from Rokstad’s batch plant with flights ranging from a short hop to up to 10 miles. 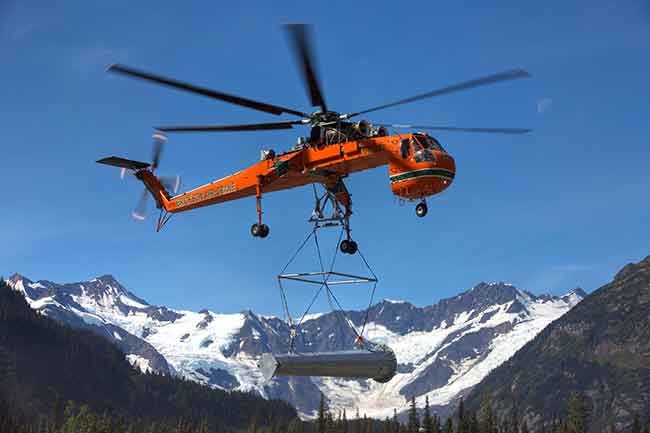 There is a team of heavy- and medium-helicopters on the project carrying out a wide range of jobs in all phases of the construction and they handle what they can, but of the jobs that Erickson is doing with the S-64, Stein points out that the Air Crane is perfectly suited for the job. And it’s more than just the raw strength of the S-64 – Erickson brings a definite sense of purpose to the job site. “We operate in very remote and austere environments and are very self-sufficient,” he said. “We bring with us all the parts and materials to operate the aircraft at a very high rate of utilization, up to eight to 10 hours of flying a day. We do all the line maintenance in the field and we can even do major component change-outs in the field – engines, rotor-heads and gearboxes and that’s somewhat unusual. Most major maintenance and component change-outs are done at a maintenance facility or depot-level maintenance facility, but Erickson has the capability to do all of that maintenance in the field. This allows us to maintain a very high operational readiness rate, in excess of 98 per cent of aircraft availability. The Erickson team is based at the mine camp site, where all their required maintenance can be done. Crews, comprised of three pilots, two mechanics, a fuel truck operator and project manager operate on a two weeks on – two weeks off rotation. When the two helicopters were operating through July the crews were doubled. The original six-month construction window having been shrunk by the late snows of spring, doesn’t make a challenging project any simpler, even with two Air Cranes on the job. The terrain the towers will march over is some of the most difficult and extreme in the country, climbing well over 6,000 feet in elevation, spanning glaciers and requiring some of the longest spans ever attempted in the country. Stein maintains they will have flown more than 500 hours on the project by the time they are finished. Erickson has a long tradition of working in Canada, particularly in British Columbia. “This has been a great partnership between Erickson and Rokstad once again,” he said. “We look forward to completing this project on schedule and are looking to future projects with Rokstad.” In addition to the ILM project with Rokstad, Erickson also worked on the Northwest Transmission Line with another contractor. There are hydro projects in Manitoba, with more in the future. The Cranes have been mainstays in heli-logging in B.C. and have been instrumental in battling some of the most extreme wildfires in recent years. Erickson has operated in Canada for more than 30 years. 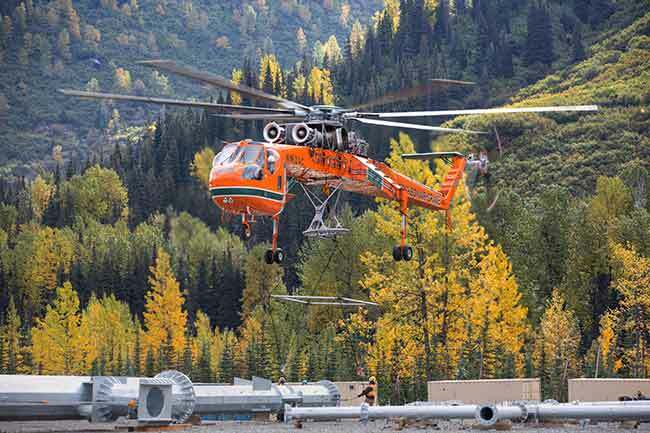 Erickson’s Skycrane has the clout to get the Brucejack mine up and running. At that, to most people Erickson means one thing – the big orange S-64 Sky Cranes. Currently, Erickson has 20 Cranes working around the world. Apart from Canada and the U.S., Air Cranes are operating in Ecuador, Peru, Australia and the Philippines and will soon be back in Malaysia, India and Greece. “It’s truly a global aircraft,” Stein said. “A lot of these aircraft will move continents twice a year. They move to Australia for our winter months in the northern hemisphere to fight fires in the southern summer and then they will move back to the northern hemisphere for the summer fire season.” In August 2016, Erickson and their Australian partner were awarded a two-year contract extension to provide wildland firefighting helicopter services in Australia. Erickson has been active in firefighting operations in Australia for more than 20 years. Under the current agreement, Erickson will provide six S-64 Helitankers to locations throughout Australia for the fire season from October through to March. The Klondike Gold Rush, according to the Canadian Encyclopedia, produced approximately 1.5 million ounces of gold during its peak years of 1897 to 1899. With the price of gold fixed at $18.74 at the time, that amounts to approximately $29 million in the dollars of the day. Far more money was spent in the effort to get to the Klondike and find the gold, than was ever paid out. Brucejack projects producing an average of 321,500 ounces of gold annually over a 22-year life span for the mine and will provide 500 full-time jobs as well as those employed in the construction phase. There is indeed gold in the hills and given the current provincial government’s position of strengthening infrastructure in the region, it seems reasonable that there will be more projects like Brucejack in the future.